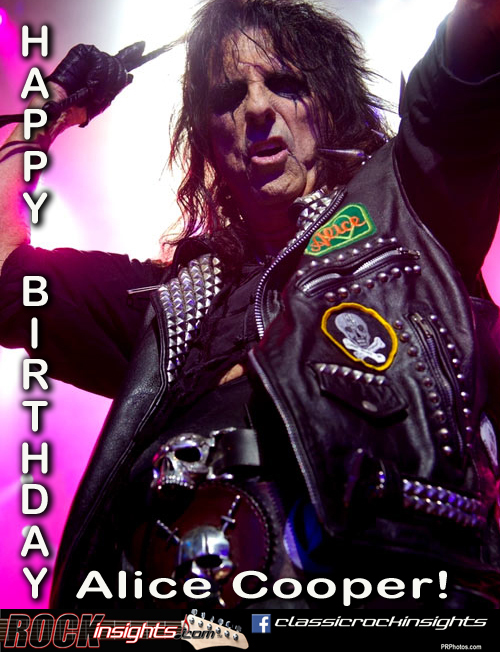 One of Rock's most entertaining people on or off the stage celebrates a birthday today. Vincent Damon Furnier was born in Detroit on February 4th in 1948. His family relocated to Phoenix when the soon-to-become Alice Cooper was in his late teens. He first performed in a high school talent show in a band he put together with other members of the cross country running team to do spoof covers of Beatles songs. Winning top prize inspired them to get real instruments and learn to play. Formed in his Junior year, The Spiders developed a solid regional following and released a couple of singles. After graduating, they began touring more widely, changed the group's name to Nazz and moved to LA. Learning that Todd Rundgren was using that name for his own band, Furnier's group came up with Alice Cooper as their new name. Their manager, Shep Gordon, himself one of the most creative and entertaining people in the business, decided one of the band members needed to be Alice Cooper, and picked Vincent. Determined to make a greater impact and be more memorable than the large pack of bands vying for attention in SoCal at the time, Alice and Gordon decided that adding theatrical elements to the band's performances and developing Cooper's character into one parents would find objectionable would make the group irresistible to young Rock fans was the way to go. Was it ever! Happy birthday Alice! Other Rockers of note born on Feb. 4 include Animals drummer John Steel (1941), Phil Ehart of Kansas (1950) and Humble Pie's Jerry Shirley (1952). Fleetwood Mac released Rumours on this day in 1977. The Police opened their Synchcronicity tour on 2/4/1984 at the Carrier Dome in Syracuse, NY, and Black Sabbath wrapped up its reunion tour on this night in 2016 in Birmingham, UK.